It’s no new news that James Bond fans are one of the most passionate groups of movie aficionados out there. From this fanship, another group of die-hard collectors has arisen, filled with men and women who will pay almost anything for authentic pieces of 007 memorabilia. 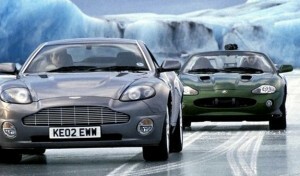 From the Land Rover and Russian T55 tank featured in Casino Royale, to the Audi A5 used in Skyfall, 59 cars used in the 007 series can be yours for £20 million. The collection includes six Aston Martins, and a yacht for extra measure. Plus, when you do the math, that’s just over £338 000 per vehicle. Not bad, considering you’re buying in bulk! There’s nothing quite like a good old fashioned autographed photo. 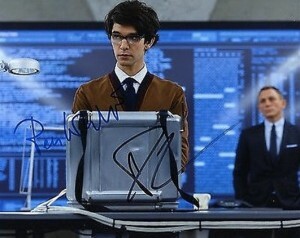 This collectible photograph, signed by both Daniel Craig and Ben Wishaw of Skyfall, can be yours for just $490.96. If you’re interested in another Bond (or Bond Girl), Hollywood Memorabilia has hundreds of signed photographs for sale. 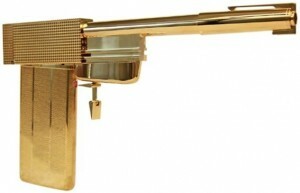 There’s nothing more iconic and representative of the entire James Bond franchise than the iconic Golden Gun. You’d be hard-pressed to get your hands on the authentic gun used in the film, but the next best thing is a 1:1 scale prop replica, officially licensed by Danjaq LLC and EON Productions. Unfortunately this replica is sold out by its actual manufacturer, but with a bit of hunting you should be able to find one for sale by a collector or reseller. Fountain Pen – Forming the ‘barrel’ of the replica, the pen screws directly into the body of the lighter. Includes removable thread cap. Lighter – With a hidden ‘slide out’ section the lighter forms the main body of the replica. The lighter ‘lid’ opens to reveal a breech chamber. Cufflink – With sprung blades, the cufflink screws into the trigger housing to create the trigger which can be pulled.